Optimizing your website is an important task for anyone that wants their website to actually be viewed. Getting your business listed #1 on Google is a priority for many Canadian businesses. This is understandable when you consider that the first listing gets 32.5% of traffic, the second spot gets 17.6%, and the third 11.4%. The remaining results get lower traffic as you go further down the list. So how to you get ranked on top of the search engine’s listings? Short answer: with lots of hard work and patience. Long answer: if you develop an optimization strategy that looks at your content and the performance of your business website, you will take a huge step toward increasing your ranking. Getting your business listed #1 on Google is a priority for many Canadian businesses. This is understandable when you consider that the first listing gets 32.5% of traffic, the second spot gets 17.6%, and the third 11.4%. Search engines are constantly crawling content to establish what your business website is about. By displaying results that include relevant keywords or phrases, viewers get a quality listing of what they’re looking for. By optimizing your website you can increase your audience viewership and target specific segments of potential clients. So, how do you optimize your content? What’s a meta tag? Meta tags are snippets of text that describe a page’s content. The meta tags don’t appear on the page itself, but only in the page’s code.Title tags are the HTML code that helps SEO and UX describe the topic and theme of a web page. You can modify your title tags in WordPress by going to Settings>General. On this page, edit the Site Title field and hit Save. You can’t set custom titles by default in WordPress for each individual page, but you can add SEO plugins like Yoast or All in One SEO Pack to add this functionality. Alt tags help make your website more accessible to viewers who use screen readers. If your image is not loading, your alt tag will show up instead. Make sure your alt tags include keywords and an accurate description of the image to optimize it. 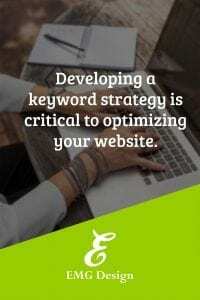 Planning out your keyword strategy is a robust topic that is critical to optimizing your website. Researching your keywords will allow you to have a better chance of ranking higher in search engines. Use Google AdWords Keyword Planner and Google Trends to assist you in your planning. Once you have your keywords figured out, place them throughout your website. They must, however, flow with the content or you will confuse your reader. Use appropriate image titles. Don’t use DSC7868.jpg as your title. This will not help your SEO. Put the main subject of your image at the head of its name. To reduce the loading time of images on your website, scale images to the size you want to show. WordPress will provide multiple sizes after uploading it. Keep in mind that this is only for scaling, not for reducing file size. Reduce the file size of your image in either Photoshop or online tools. A simple Google search of image optimizing will result in a long list of tools you can use to reduce the file size of your image. Have other websites that are relevant to your content link back to you. Backlinks should be from trusted, high-quality sources. Search engines love new quality content—stress on the quality. Given that “Google’s mission is to organize the world’s information and make it universally accessible and useful,” you need to provide current, quality content to ensure your business website is crawled by major search engines and to give website viewers a beneficial experience. By optimizing your website and providing new content you will improve your ranking in search engines. Search engines love new quality content—stress on the quality. As you can see, optimizing your content can be a lengthy process. By taking the time to optimize your content, your business website will be ranked higher in search engine results. This isn’t the only factor that is used in the algorithm, but it is a major one. It is a big step in the right direction to decide on your marketing goals, research your chosen keywords, and provide quality content to that viewership. What other optimizing tips can you add to this list? Share your comments below. Receive my FREE Homepage Website Checklist to a high performing website. Plus my quarterly newsletter with web design how-to’s, personal branding tips and marketing strategies to grow your business. I want my FREE checklist! I don’t SPAM. You’ll receive my free Homepage Website Checklist plus one email newsletter every 2 months giving helpful tips and articles on marketing your small business online. I don’t share or sell your information with anyone. Website strategies are an important part of planning a business website. Canadians spend an average of 28 hours a week online. With the amount of time, they spend online their comfort level with purchasing products and services online has substantially increased over the past five years. Even though business owners know they should have a website in today’s marketplace, many don’t. Why do businesses delay creating online identities for their business? Some business owners are not comfortable with technology. Others don’t have time. Many Canadian businesses are at a loss when it comes to what content they should put on a website. What website strategies should businesses use to appeal to the Canadian consumer? Get Organized & Save Hours of Time!